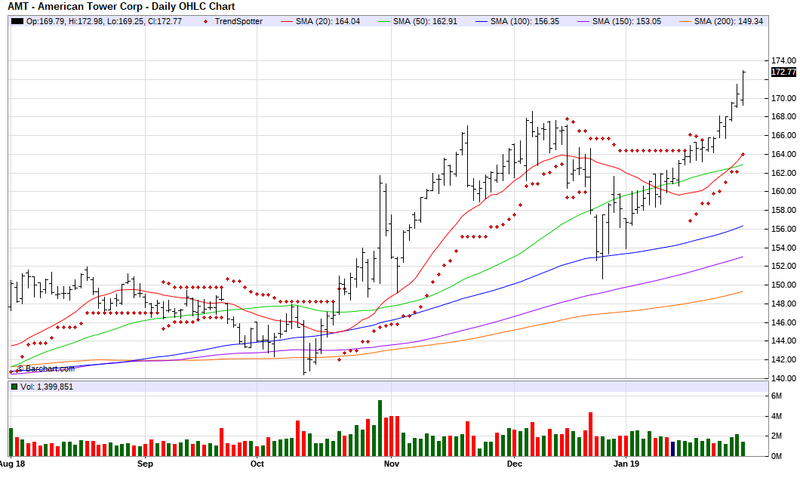 The Barchart Chart of the Day belongs to the communication REIT American Tower (AMT). I found the stock by sorting Barchart's Top Stocks to Own list first by the most frequent number of new highs in the last month then used the Flipchart feature to review the charts for consistent price appreciation. Since the Trend Spotter signaled a buy on 1/23 the stock gained 4.21%. American Tower Corporation, one of the largest global REITs, is a leading independent owner, operator and developer of multitenant communications real estate. In addition to leasing space on towers, they provide customized collocation solutions through our in-building systems, outdoor distributed antenna systems and other right-of-way options, managed rooftops and services that speed network deployment. Headquartered in Boston, Massachusetts, American Tower has offices across the United States and in Argentina, Brazil, Chile, Columbia, Costa Rica, France, Germany, Ghana, India, Mexico, Nigeria, Paraguay, Peru, South Africa and Uganda.